It would seem that Elliot has taken to modelling knitwear as a duck takes to water. He’s absolutely a natural. He remains sweet tempered and easygoing, thus making him more like his father than any McPhee alive. He’s seen here wearing a simple little garter sweater I banged out for him, because it’s still very chilly here in Toronto, and I am helpless not to swath him in great bales of wool for fear that he’s ever even a little bit cool for even one moment. You would think that I didn’t know about central heat, the way I’m acting. Yarn: One yummy little skein of Meadowcroft Dyeworks Rockshelter worsted in a colour ironically named Skinny Dipping, which is the only thing that Elliot doesn’t like. Knit up on 4mm needles (I faked the pattern) and embellished with three little porcelain buttons from Round Rabbit. They’re perfect. When I finished that, I got out a Habu Jacket that I’ve been meaning to knit myself, but I’m not sure it’s going to take. I think Elliot needs more bootees. Or a hat. Or maybe another sweater. He’s bigger every day, and I’m going to have trouble keeping up with him. He is beautiful, and yes please more knits, more photos and more cuteness. What a cutie!! Love the sweater- what a luscious colour!!!!! If anyone can keep up knitting projects at the rate a new born grows, you can!! Don’t even try to fight it. You already have sweaters, don’t you? Knit the tiny things now, while he’s tiny. Thank you for more photos of Elliot! He’s beautiful. I love the little sweater, and yes, he’ll grow out of that one quickly. Don’t resist the urge to knit everything for him. It’s your privilege! And we The Blog, would be disappointed if you didn’t follow that urge. 🙂 Did I mention that he’s gorgeous!? Agreed on all counts– he’s a little beauty, and we want to see more baby knits modeled by the cutie! Also, when you knit for babies I get to see the patterns you choose and then I want to knit them. I like that part. So cute! Oh, and the jacket’s nice, too. I am starting to wonder whether his Mum is going to need a larger chest of drawers in the nursery. So cute! Would that we all had such chubby little babies to knit for! Previous report wasn’t exaggerating about the baby pictures, was it? Ha ha ha! Enjoy the wee one while you can knit him a complete ensemble in less than a week. Fortunately you will have your photos as proof that he was a very sleepy and quiet little bundle who was head to toe in knits. You’ll need these when he turns into a real boy, running around making a racket and shunning knitwear, but not for a long while I hope. I’m fairly sure you’re going to be in the position to have sweaters to knit for yourself for a long time coming. Elliot, however, is only going to be this tiny now. Knit him all the little things while you can. Thank you for sharing him and the knits with us. My grandson is 5 months old now and I’m struggling to keep up with knitting that isn’t for him. I did give up on booties after he grew out of 3 sizes in 6 weeks as he has long feet and likewise long fingers so ickle wickle mittens didn’t fit long either. Fortunately in the UK they’re not essential. Enjoy! Being a granny is fabulous, weird in some ways but fabulous. Definitely male top model 2017! He is one beautiful baby. (PS love the outfits too!). Thanks for sharing with us. He is just beautiful and models the handknits like a pro. Knit all the baby things! The joy of babies- they grow. And thus need more (and more) knitted love. Enjoy the journey- we certainly are! I am so glad that you are finally knitting up a storm!!! I was worried —other than the beautiful blanket that you spent forever (for you) on, you didn’t really have a pile of knits for this cute little bean! I kept thinking —why hasn’t she got a trunk full of knits of every kind in every color? So finally you have your grandma knitting mojo!!! Keep it up— he is just adorable and needs to be modeling many many things!!! He is beautiful. So perfectly beautiful. And it’s cold out tonight. Not to mention damp. Knit wee things. Knit lots of wee things. Of course he took to this modeling gig – doesn’t he have the World’s Greatest Knit Wear Model for an aunt? Knit your love into every stitch to make lovely things for a beautiful boy!! Enjoy every minute of being a grandma! Too precious and extremely photogenic. Might we have another World’s Greatest Knitwear Model™ in the making? Grandma….. best job EVER!! Enjoy all the love, my friend! Oh, yes, I see a long career as the World’s Greatest Tiny Knitwear Model. This part of The Blog won’t get tired of seeing him in any finery that falls off your needles. So he’s not a fan of baths yet? That’ll change. Pretty soon there’ll be bubbles and water all over the bathers and the bathee and the bathroom, maybe even the hallway on a good night. Beautiful sweater! Infinitely more beautiful baby! They grow so fast-knit like the wind! Canada’s Next Top (Tiny) Model! I reckon that at the speed you knit you can bang out an item a day … I look forward to seeing the results!! He’ll need lots of modelling practice at this stage, surely? 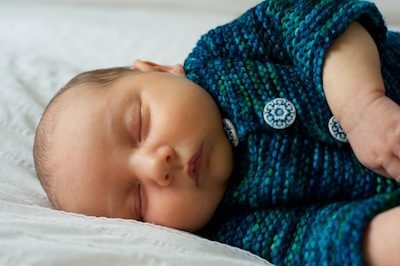 Sweet little Elliot needs a copy of my all time favorite baby sweater — it’s YOUR pattern — the Nouveau-né ! It has a beautiful honeycomb yoke. I made one for my little granddaughter and they loved it so much she wore it until the ends of the sleeves were above her elbows. Oh how I wish it came in toddler sizes!!! 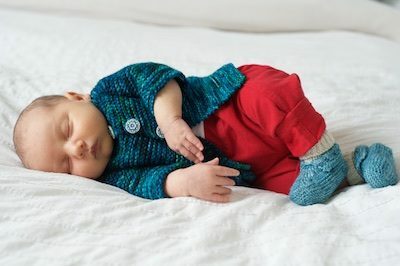 Thank you for all your inspiration — I’m SO looking forward to seeing all the knits you make for that darling little grandson! love the pics. love the knits. love the love. Beautiful sweater! 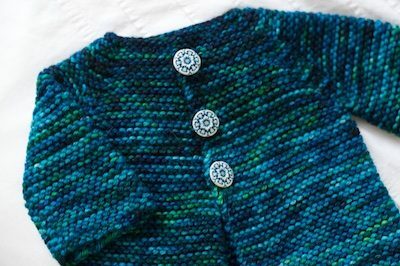 I love the colors and the buttons are perfect, as is the wee little one wearing your handmade. When the weather finally gets warm, you can knit Elliot all sorts of things in various larger sizes for the coming fall and winter. Nary a day shall pass when you’ll be at a loss for what to cast on next; plus, such projects will be small enough to carry around on your errands out of the house. Keep the photos of babe and knitwear coming! But don’t forget about socks for the Christmas box; you may already be a month or too behind on that because of the gorgeous blanket for Elliot. All I can think is “damn fine work, Megan.” You can practically see him growing, can’t you? Please tell Meghan thank you for being willing to share her small person with us. Also, he (and the knits) are gorgeous. It would appear “that the glory that is your girl” is doing a fabulous job – Elliott looks so fit and healthy. Love the colours in that jacket. Thank you Alex and Megan for sharing the photos with The Blog. My favorite baby sweaters are textured hoodie cardigans. There’s just something about a big hoodie surrounding a cute baby face that’s irresistible. Elliott appears to have a face made for one! O.M.G.!!! Those cheeks! He is so adorably kissable! I wouldn’t care if the rest of this blog was ever only photos of dear sweet Master Elliot! This little one really gets cuter by the day! I agree that he is a natural knitwear model. Here’s hoping he keeps that job for years to come! My first thought: Elliot looks so incredibly healthy! Clearly he is well nourished — mostly with love, I’m sure! My goodness, he is the picture of contentment! Full belly and swathed in woolly goodness. Adorable! I thought we’d already covered this. I could be totally wrong, but I somehow get the impression that you are a little bit fond of that sweet baby. <3 Enjoy every precious minute, grandma! Adorable baby and sweater. Babies are so easy to knit for. So tiny and so fast. My grandkids are all past the baby stage now and I can’t knit because of shaking hands. Thanks for letting me live vicariously through you. He’s just perfect. I’ve been meaning to leave a comment re the delivery and your first post about Elliot. You have been so generous. I shared your posts with my best friend since we became moms together and raised daughters together, and we both sat there and cried because you were able to capture and put into words some deep feelings that we have had but never been able to write down with your eloquence and grace. Thank you. Awww! Wee baby. Wee knits . Beyond cute. I knit too slowly to knit anything for anyone yet, so please keep the pictures coming, as long as his mum doesn’t mind, and knit all the things! What a nice face. Nice sweater and booties too…. All babies are cute, but Elliot is beautiful! Thanks for the pictures. I’m just gonna throw this out there…the concept of knitting a biggish style of sweater, one that can have the sleeves rolled up to start with, and can suit from ‘baggy’ to ‘fitted’ as the little person grows–that whole thing is just a really theoretical concept at this point, am I correct??!? Uh-oh… he sounds like a sucker baby…. a baby so easy that they sucker you into having another baby! Again, congrats on being a grandma! My mother knitted a sweatsuit for my son when he was a newborn, and at four, he’ll take out his “knittinening” himself 🙂 keep on knitting for that precious one! He is so handsome. Thank you for sharing. I cannot help but notice what appear to be lovely long fingers. Maybe piano, or guitar? Good heavens! Already nearly one month and look how he’s grown. He is a looker. And his wardrobe! The Sartorialist will soon be calling. Aw, still in that neonate sleep-through-anything phase. Love the adorable little sweater! Have fun knitting for him!! Hope life is settling down into a new routine with him in it! He’s beautiful. Just keep knitting those wee things and enjoy! He is so, so beautiful – thank you for sharing his perfection with us. Love wee babies in beautiful woolies. My son did not enjoy his bath as a newborn either. Elliot is so squishy and cuddly looking, and really just lovely. Thanks to Meg for sharing him with us. And don’t forget all the adorable wee knitted toys. Dinosaurs, fishies, bunnies, etc. Elliot surely needs those to cuddle! Keep taking pictures and knitting as fast as you can…because we all know (from experience with Hank who magically grew up when I blinked one time) before we know it he will be an adult and we (the blog) will wonder where the time went! So precious! Thank you for sharing him with us! “fear that he’s ever even a little bit cool for even one moment”? You’re doomed: He’s innately cool! What a perfectly beautiful little one! And an excellent knitwear model, to boot! Just wanted to say thank you for supplying us with a new round of Elliot photos – keep ’em coming, grandma! He is perfection (and the knitwear is lovely too). Today I received a picture of my niece (now 9) modeling her Baby Surprise Jacket I knitted right after she was born. Maybe you will see these knits again too. OMG! Look at those little lips and the cute little nose! He’s just so adorable! I love the knits too! He is very cute, and very like his Dad! Love the sweater! Love the model! Elliot is a beautiful baby! That colour is stunning, or maybe it’s just Eliot.. Nah it’s clearly both. 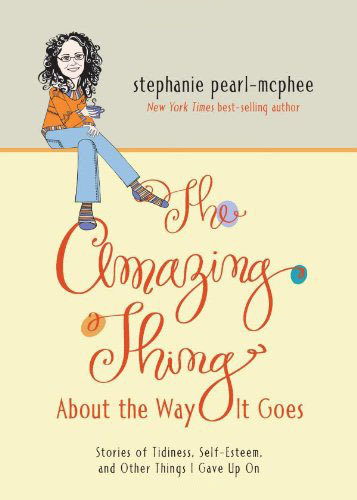 How things have changed since you wrote, way back in 2008, “It is no grand secret that I am partial to babies, and I think it should be no surprise that I am especially besotted by the girl babies. When my friends are expecting, I am always and forever hoping it will be a girl. I think this stems from having had only girls myself, it’s like I can’t properly imagine that they come in the boy flavour. Adoring my daughters as I do (and especially as I did when they were so wee) I feel that a daughter is the best one can hope for, and this leaves me wishing through all my friends and families pregnancies that they will deliver up girlchildren. Little Elliott, like his cousins Hank and Luis, could not be more loved and you are going to be the best granny ever! He’s such a little dolly. Please keep sharing many pictures of him and your lovely knits. How are mom and dad doing? It’s always rough getting the feeding routine down, especially if Megan is nursing! I did with my kids too but one never quite remembers how sore it is to start! How lovely for you… a precious grandson to dote on. And how lovely for us… baby pics AND tiny knitted things pics! Blessings to your whole family! He’s gorgeous!! Looks so snuggly!! I love the colour & knit of that sweater! Keep those pics coming – love seeing the wee mite, especially in his knitted items. He is perfect. He definitely needs to stay warm! I wonder if immediately after taking this photo the little guy was covered with a knitted wool blanket…..
Beautiful baby and beautiful sweater! Enjoy every minute with that grandson. They grow up so fast! I have a new grandbaby due to arrive in Nov. Any chance you will be writing down how you made Elliot’s? It gets cold in Michigan too!